1 March 1962: Los Angeles Airways inaugurated scheduled passenger service utilizing twin-engine, turbine-powered helicopters. 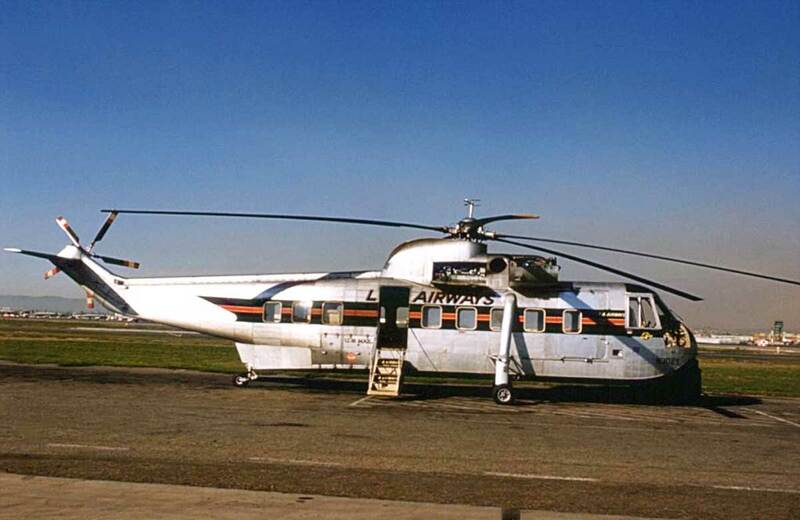 Shown in the photograph above is LAA’s Sikorsky S-61L, FAA registration N300Y, at the Disneyland Heliport, Anaheim, California. LAA was the first civil operator of the S-61, purchasing them at a cost of $650,000, each. N300Y was the prototype S-61L, serial number 61031. On 14 August 1968, N300Y suffered a catastrophic main rotor spindle failure and crashed at Leuders Park, Compton, California. All 21 persons aboard were killed. Los Angeles Airways began operations in 1947 and continued until 1971. It flew Sikorsky S-51, S-55 and S-61L helicopters. The Sikorsky S-61L was a civil variant of the United States Navy HSS-2 Sea King and was the first helicopter specifically built for airline use. The prototype, N300Y, first flew 2 November 1961. It is a large twin-engine helicopter with a single main rotor/tail rotor configuration. Although HSS-2 fuselage is designed to allow landing on water, the S-61L is not amphibious, having standard landing gear rather than the sponsons of the HSS-2 (and civil S-61N). The S-61L fuselage is 4 feet, 2 inches (1.270 meters) longer than that of the HSS-2. The S-61L is 72 feet, 7 inches (22.123 meters) long and 16 feet, 10 inches (5.131 meters) high, with rotors turning. The fully-articulated main rotor has five blades and a diameter of 62 feet (18.898 meters). Each blade has a chord of 1 foot, 6.25 inches (0.464 meters). The tail rotor also has five blades and a diameter of 10 feet, 4 inches (3.149 meters). They each have a chord of 7–11/32 inches (0.187 meters). At 100% NR, the main rotor turns 203 r.p.m. and the tail rotor, 1,244 r.p.m. The S-61L was powered by two General Electric CT58-110 turboshaft engines, each of which had a continuous power rating of 1,050 shaft horsepower and maximum power of 1,250 shaft horsepower. The main transmission was rated for 2,300 horsepower, maximum. The S-61 has a cruise speed of 166 miles per hour (267 kilometers per hour). The service ceiling is 12,500 feet (3,810 meters). Its maximum takeoff weight is 20,500 pounds (9,298.6 kilograms). 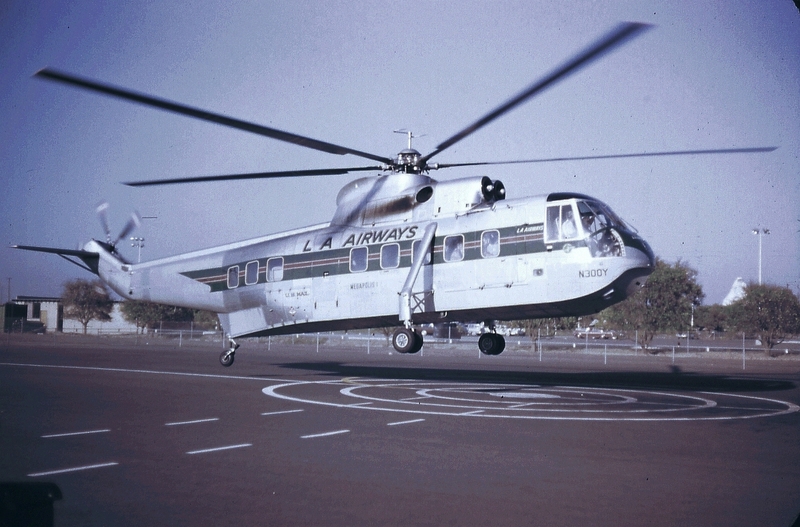 Between 1958 and 1980, Sikorsky built 794 S-61-series helicopters. 13 were S-61Ls. 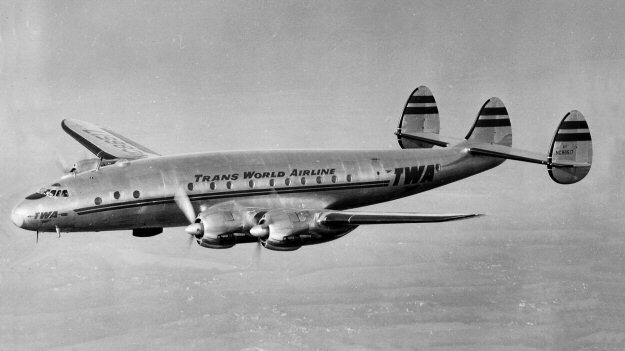 5–6 February 1946: Transcontinental and Western Airlines—TWA—”The Trans World Airline,” flew its first revenue international passengers on a scheduled transatlantic flight from La Guardia Field, New York (LGA) to Aéroport de Paris-Orly, Paris (ORY). 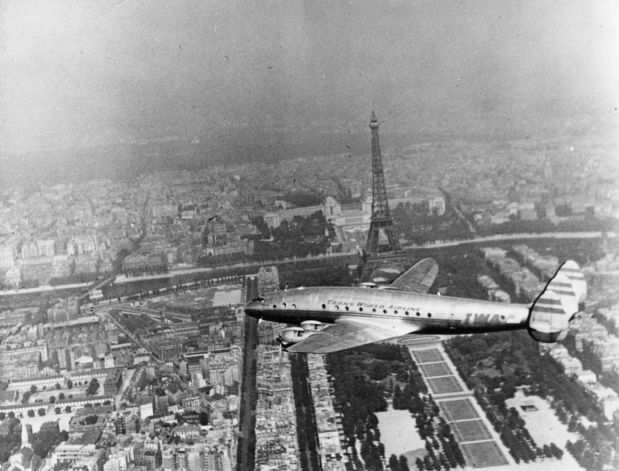 The airplane was a Lockheed L-049 Constellation, serial number 2035, NC86511, named Star of Paris, under the command of Captain Harold F. Blackburn. Captains Jack Hermann and John M. Calder, Navigator M. Chrisman and Flight Engineers Art Ruhanen, Ray McBride and Jack Rouge completed the flight crew. Purser Don Shiemwell and Hostess Ruth Schmidt were in the cabin along with 36 passengers. Star of Paris departed LaGuardia at 2:21 p.m., EST, 5 February. The flight made brief stops at Gander, Newfoundland (YQX) and Shannon, Ireland (SNN), and arrived at Orly Field, at 3:57 p.m., February 6. The elapsed time was 16 hours, 21 minutes. Confusion exists over which TWA Constellation made the first scheduled flight from LGA to ORY. This is probably because two days earlier, 3 February, another L-049, Paris Sky Chief, NC86505, s/n 2026, also commanded by Hal Blackburn, flew from Washington National Airport (DCA) to Paris Orly as a trial. On that flight, the Constellation averaged 316 miles per hour (509 kilometers per hour). This non-scheduled trip took 14 hours, 47 minutes, total elapsed time, with 12 hours 57 minutes actual flight time. 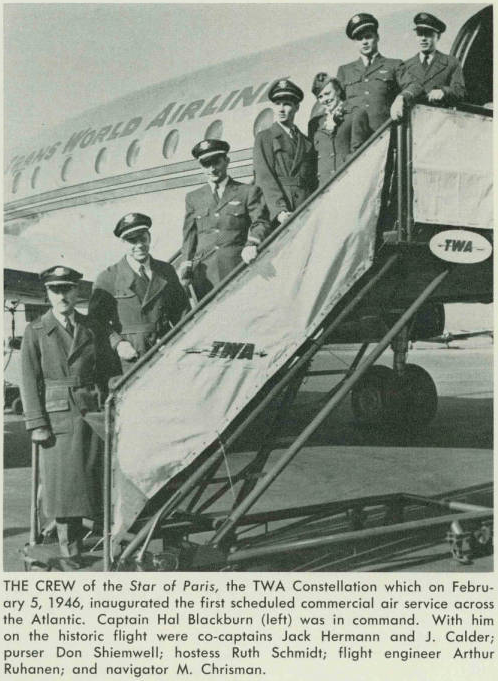 Paris Sky Chief‘s TWA fleet number was 505, while Star of Paris was number 555. Harold F. Blackburn was born in 1901 at Urbana, Illinois. He joined the U.S. Army Air Corps in 1928, and studied aviation at the University of Southern California. He received his Air Corps pilot’s wings in 1930. In 1932, Blackburn participated in the relief of the Native American reservations near Winslow, Arizona, which had been cut off by a winter storm. His entire unit, the 11th Bombardment Squadron, based at March Field, Riverside, California, was awarded the Mackay Trophy. Lieutenant Blackburn married Miss Martha Bondurant in 1932. They would have a son Robert, and daughters Beverly, Bonnie and Betty. Beverly died in infancy 1 December 1943. Blackburn would later marry Helen Jones. Hal Blackburn began flying with TWA in 1934 and remained with the company for over 25 years. During World War II, he flew Boeing 377s across the South Atlantic for the airline’s Intercontinental Division, of which he would become the manager. In addition to the New York-Paris flight in 1946, Blackburn flew TWA’s first Boeing 707 from New York to Paris in 1961. “Blackie,” as he is known to his friends, has been an active pilot since 1919. His air time equals three years spent above the earth’s surface during which he has logged more than six and a half million miles . . . The Washington Post named him the “Ideal Father” in 1946. Capt. 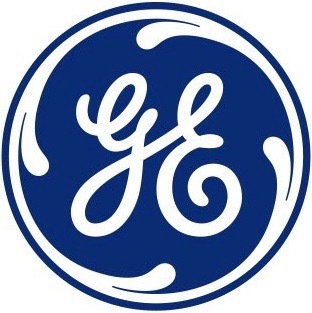 Blackburn also assisted with the formation of Saudi Arabian Airlines, Ethiopian Airlines and Deutsche-Lufthansa. Viewed by the news media as the ideal model pilot, Capt. 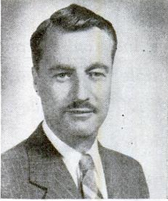 Blackburn has been the subject of two lengthy profiles in the New Yorker magazine . . . In 26,800 hours of flying, Capt. Blackburn never injured a passenger, nor damaged an aircraft, and was never late for a flight. Married for 32 years, he is the father of four children and three times a grandfather. He resides in the heart of Pennsylvania Dutch Country. He retired from flying in 1962. His last flight, in command of a TWA SuperJet [the company’s name for the Boeing 707 or Convair 880] from Rome to New York, was the subject of an hour-long television documentary. Captain Blackburn was the subject of Like a Homesick Angel, a biography by John Bainbridge, Houghton Mifflin, 1964. He died at Oakland, California, 4 August 1989, at the age of 87 years. 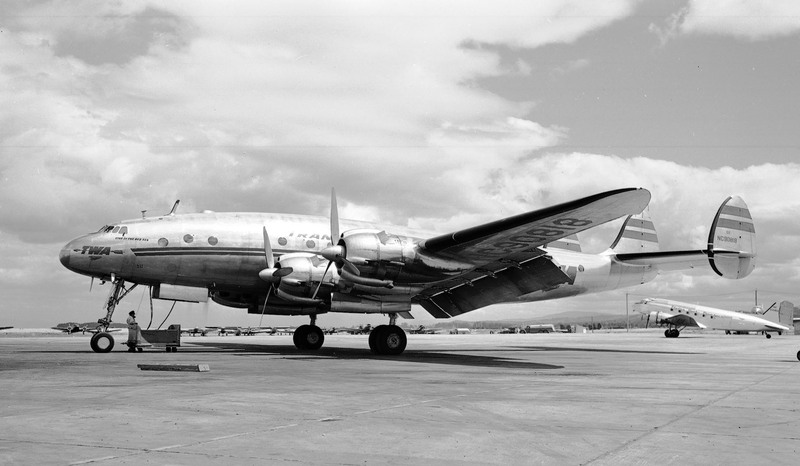 Star of Paris (serial number 2035), a Lockheed Model L-049-46 Constellation, had been built at Lockheed Aircraft Corporation’s Burbank, California, plant and delivered to Transcontinental and Western in December 1945. 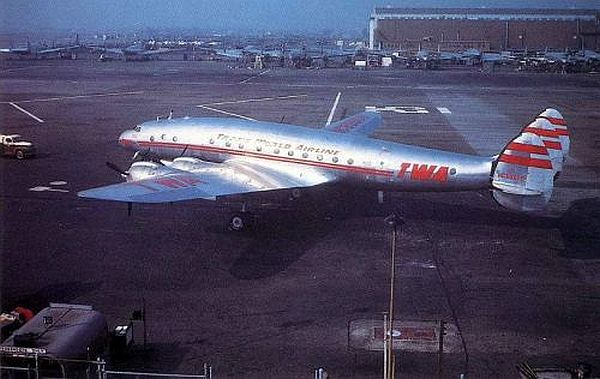 The airliner remained in service with TWA until 1 September 1961. During that time it was also named Star of Dublin. The Lockheed Constellation first flew in 1942, and was produced for the U.S. Army Air Corps as the C-69. 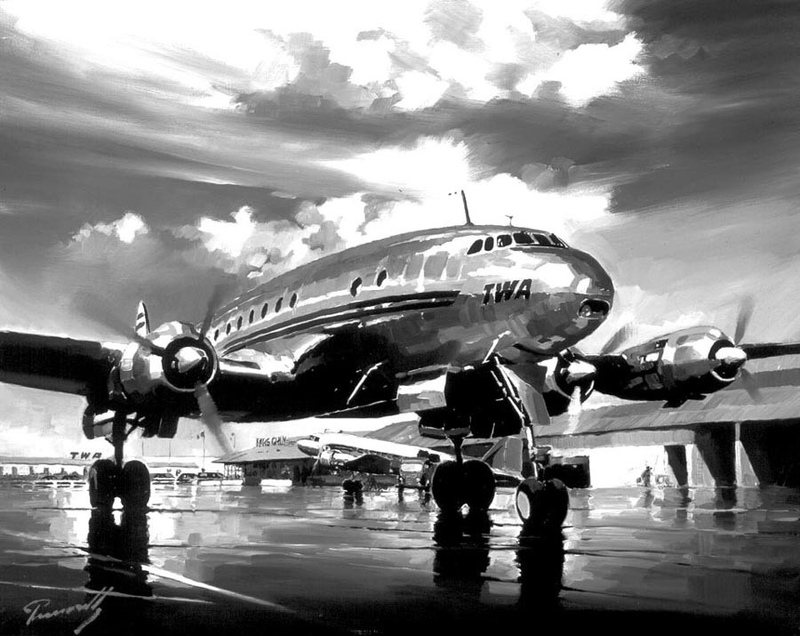 With the end of World War II, commercial airlines needed new airliners for the post-war boom. The Constellation had transoceanic range and a pressurized cabin for passenger comfort. The Lockheed L-049 Constellation was operated by a flight crew of four and could carry up to 81 passengers. The airplane was 95 feet, 1 3⁄16 inches (28.986 meters) long with a wingspan of 123 feet, 0 inches (37.490 meters), and overall height of 23 feet, 7⅞ inches (7.210 meters). It had an empty weight of 49,392 pounds (22,403.8 kilograms) and maximum takeoff weight of 86,250 pounds (39,122.3 kilograms). 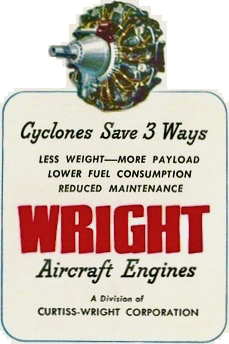 The L-049 was powered by four air-cooled, supercharged and fuel-injected, 3,347.662-cubic-inch-displacement (54.858 liter) Wright Aeronautical Division Cyclone 18 ¹ 745C18BA3 two-row 18-cylinder radial engines with a compression ratio of 6.5:1. The -BA3 was rated at 2,000 horsepower at 2,400 r.p.m., or 2,200 horsepower at 2,800 r.p.m., for takeoff, (five minute limit). The engines drove 15 foot, 2 inch (4.623 meter) diameter, three-bladed Hamilton Standard Hydromatic constant-speed propellers through a 0.4375:1 gear reduction. The 745C18BA3 was 6 feet, 4.13 inches (1.934 meters) long, 4 feet, 7.78 inches (1.417 meters) in diameter and weighed 2,842 pounds (1,289.11 kilograms). The L-049 had a cruise speed of 313 miles per hour (503.72 kilometers per hour) and a range of 3,995 miles (6,429.3 kilometers). Its service ceiling was 25,300 feet (7,711 meters). 22 C-69s and 856 Constellations of all types were built. Designed by the famous Kelly Johnson, the Lockheed Constellation was in production from 1943–1958 in both civilian airliner and military transport versions. It is the classic propeller-driven transcontinental and transoceanic airliner. 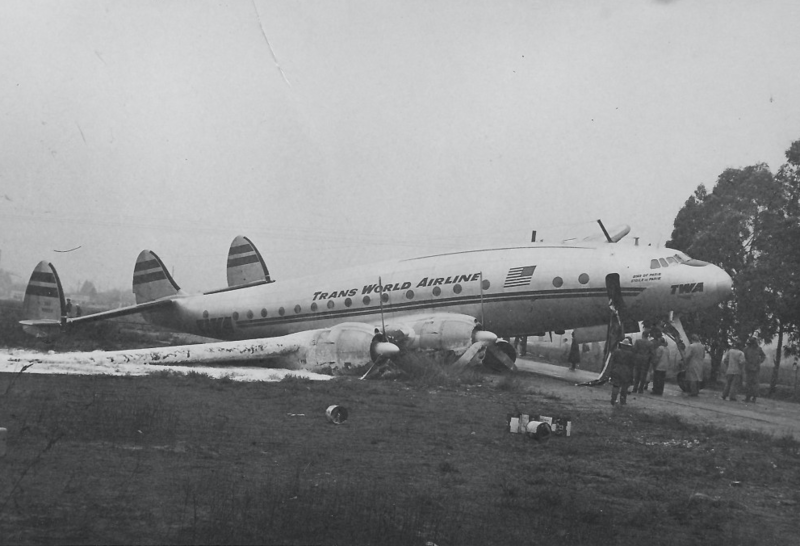 On 18 November 1950, TWA’s Constellation NC86511 suffered failures of the two inboard engines while taking off from Los Angeles International Airport (LAX). The airliner was diverted to nearby Long Beach Airport (LGB) for an emergency landing. The crew made an instrument approach and could not see the runway until the last moment, touching down at approximately midway. The runway was wet and the airplane could not be stopped before running off the end. The right main landing gear collapsed. The Constellation was damaged but repaired and returned to service. It was later renamed Star of Dublin. On 1 September 1961, NC86511 was operating as TWA Flight 529 from Chicago Midway Airport (MDW) to Los Angeles, California. Shortly after takeoff a mechanical failure caused to airplane to pitch up and stall. 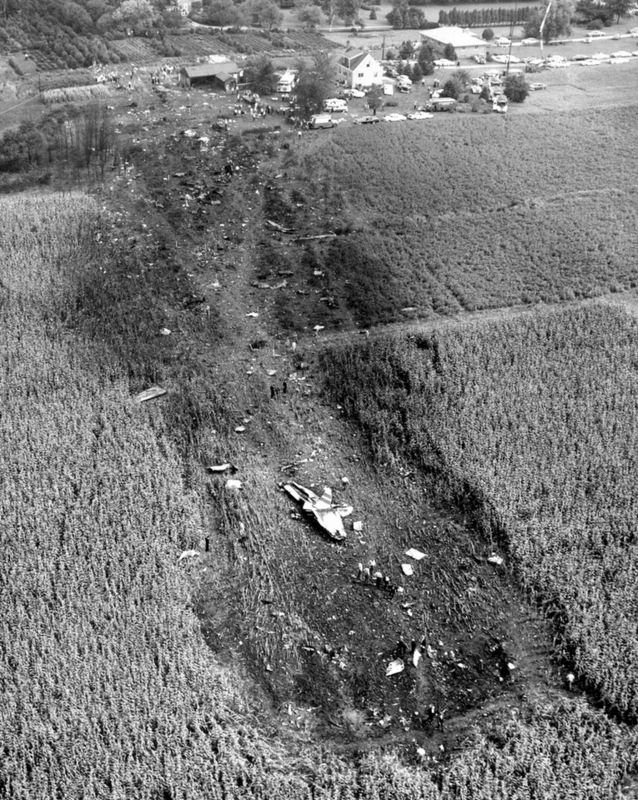 The flight crew was unable to regain control of the Constellation and it crashed in a field near Hinsdale, Illinois. All 78 persons on board were killed. 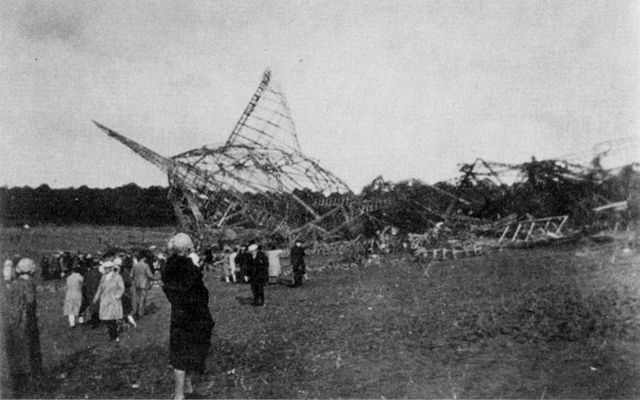 The crash site of Trans World Airlines’ Flight 529, Lockheed L-049 Constellation s/n 2035, NC86511, Star of Dublin. 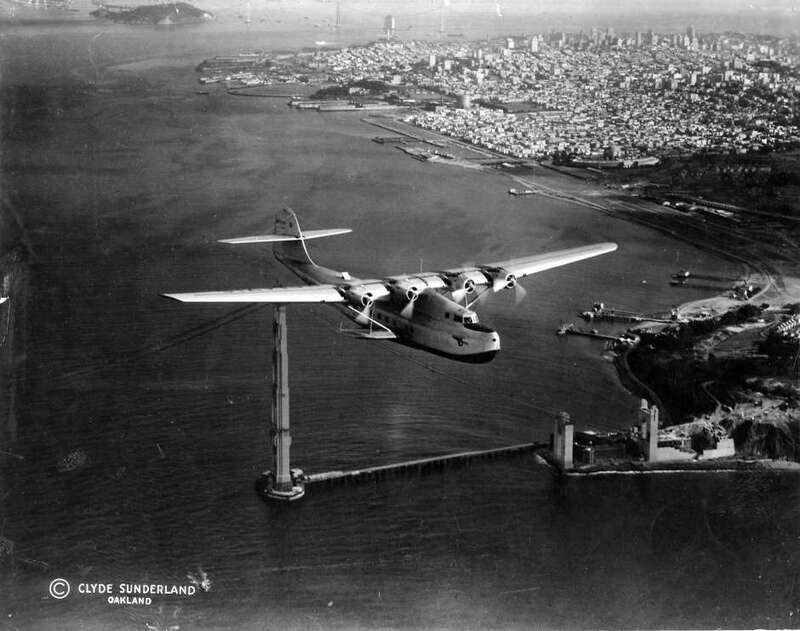 Pan American Airways’ Martin M-130 flying boat, China Clipper (NC14716), leaving the Golden Gate enroute to Honolulu, 22 November 1935. Photographed by Clyde Herwood Sunderland, Jr. (1900–1989). 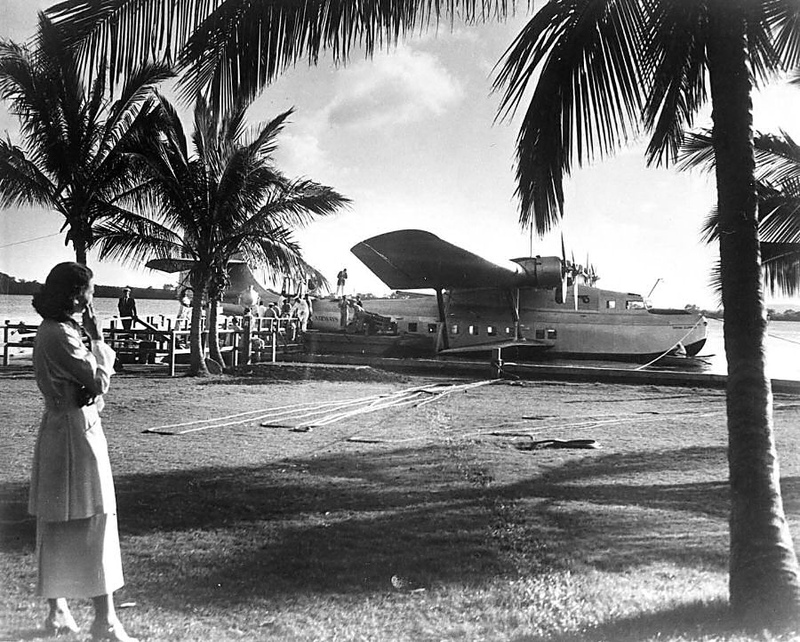 22 November 1935: The Pan American Airways flying boat, China Clipper, a Martin M-130, NC14716, departed Alameda, California (an island in San Francisco Bay) at 3:46 p.m., Friday, and arrived at Honolulu at 10:39 a.m., Saturday, completing the first leg of a five-day trans-Pacific flight to Manila. The aircraft commander was Captain Edwin Charles Musick, with First Officer Robert Oliver Daniel (“Rod”) Sullivan. 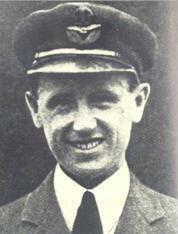 The navigator was Frederick Joseph Noonan, who would later accompany Amelia Earhart on her around-the-world flight attempt. There were also a Second Officer and two Flight Engineers. The cargo consisted of 110,000 pieces of U.S. Mail. Captain Edwin Musick and R.O.D. Sullivan, at the center of the image, next to the China Clipper before leaving San Francisco Bay with the first transpacific airmail, 22 November 1935. 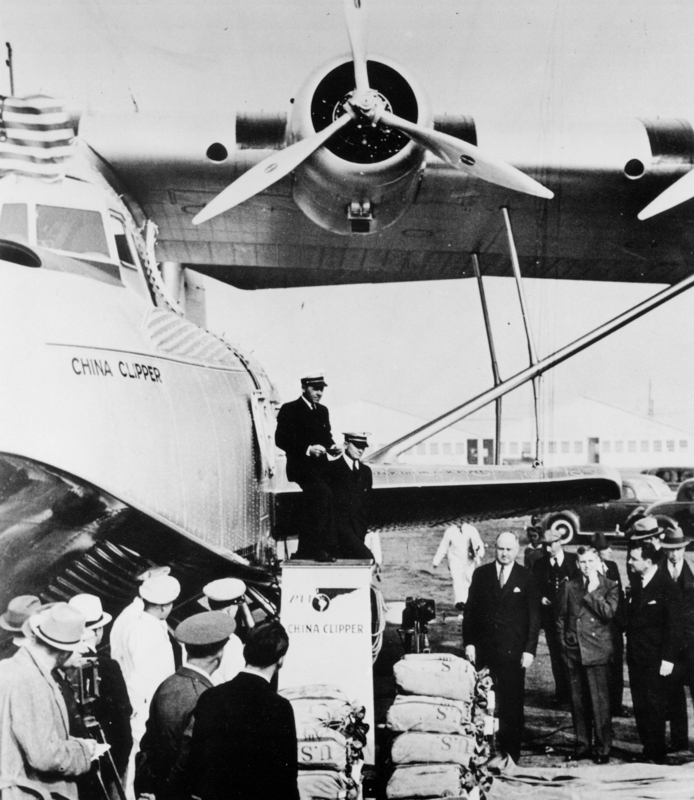 The three men at the right of the image are (left to right) Postmaster General James Farley; Assistant Postmaster General Harllee Branch; and Pan American Airways’ President Juan Trippe. 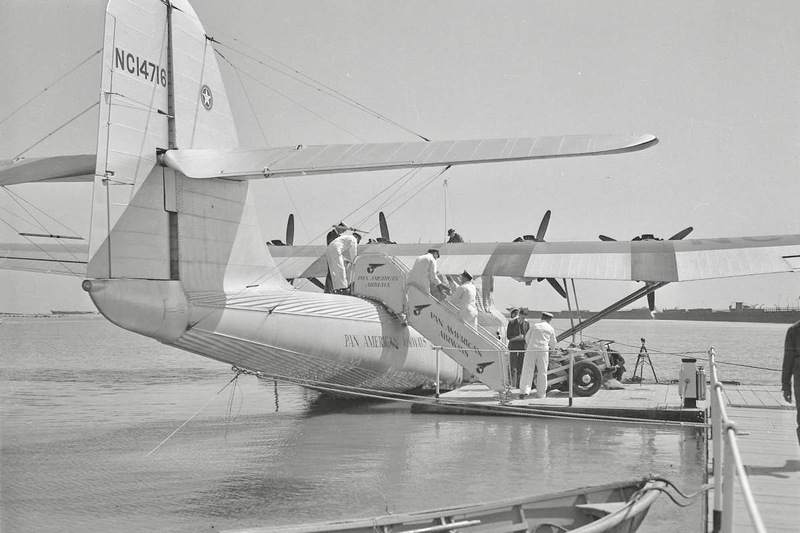 NC14716 was the first of three Martin M-130 four-engine flying boats built for Pan American Airways and was used to inaugurate the first commercial transpacific air service from San Francisco to Manila in November, 1935. Built at a cost of $417,000 by the Glenn L. Martin Company in Baltimore, Maryland, it was delivered to Pan Am on October 9, 1935. The airplane’s serial number was 558. The M-130 was operated by a flight crew of 6–9, depending on the length of the flight, plus cabin staff, and could carry 18 passengers on overnight flights, or a maximum 36 passengers. 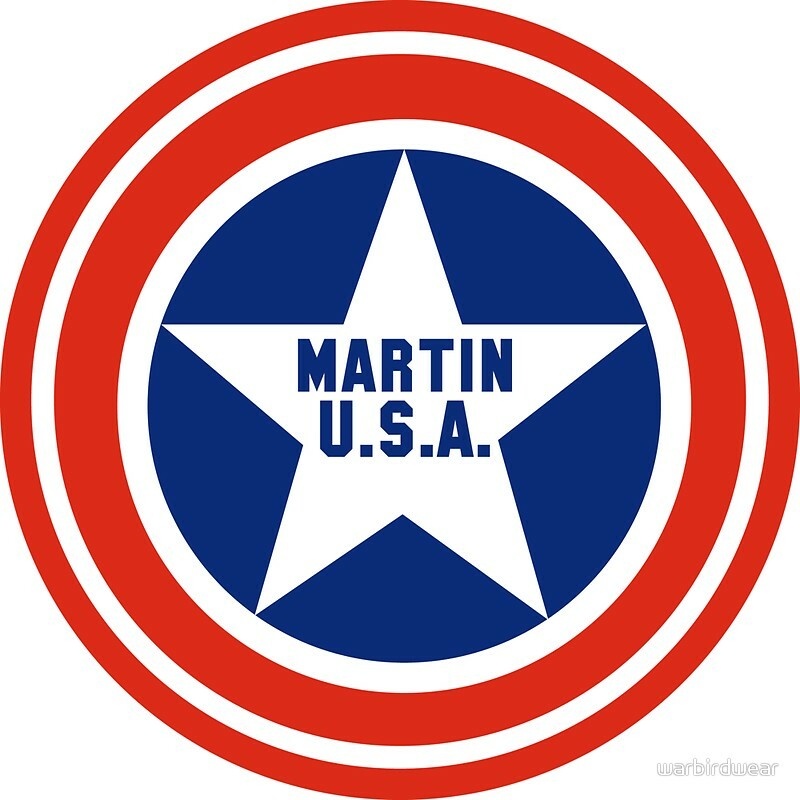 The Martin M-130 was 90 feet, 10.5 inches (27.699 meters) long with a wingspan of 130 feet, 0 inches (39.624 meters). It was 24 feet, 7 inches (7.493 meters) high. The total wing area was 2,315 square feet (215 square meters), including the “sea wings”. Its maximum takeoff weight was 52,252 pounds (23,701 kilograms). 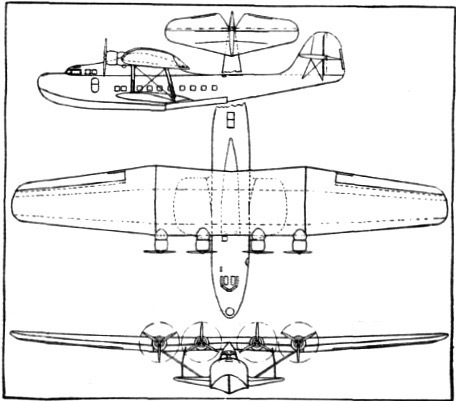 The flying boat was powered by four air-cooled, supercharged Pratt & Whitney Twin Wasp S2A5-G two-row 14-cylinder radial engines with a compression ratio of 6.7:1. They had a normal power rating 830 horsepower at 2,400 r.p.m., and 950 horsepower at 2,550 r.p.m. for takeoff. They drove three-bladed Hamilton Standard Hydromatic constant-speed propellers through a 3:2 gear reduction. The S2A5-G was 3 feet, 11.88 inches (1.216 meters) in diameter, 4 feet, 8.75 inches (1.441 meters) long, and weighed 1,235 pounds (560 kilograms). Martin M-130 NC14716, right rear quarter view. The airplane had a cruise speed of 130 miles per hour (209 kilometers per hour) and a maximum speed of 180 miles per hour (290 kilometers per hour). The M-130’s service ceiling was 10,000 feet (3,048 meters). Its range was 3,200 miles (5,150 kilometers). Suzanna Darcy joined Boeing’s engineering department in 1974. She learned to fly with the Boeing Employees Flying Association. Darcy graduated from the University of Washington in 1981 with a Bachelor of Science degree in Aeronautics and Aeronautical Engineering. She then became a ground school instructor for Boeing’s Model 757 and 767 airliners. 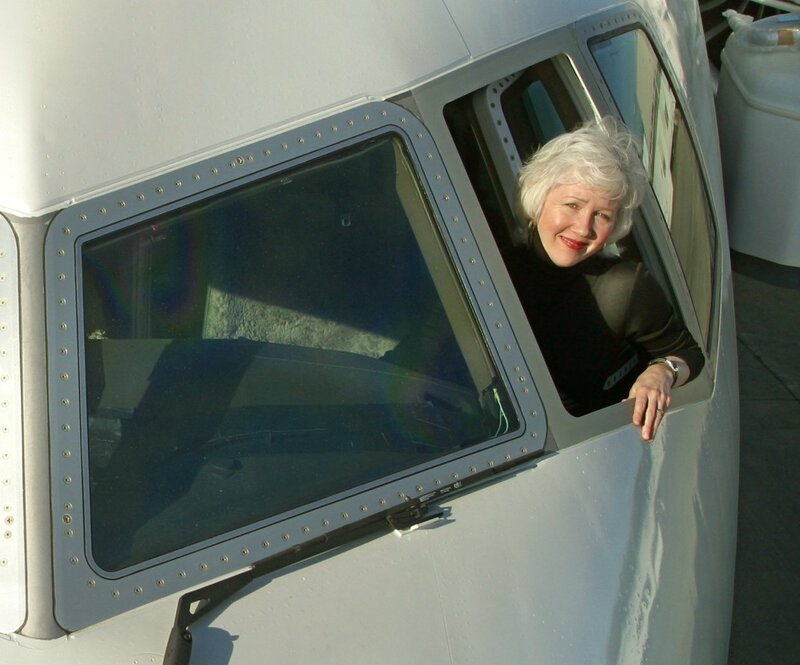 In 1985, Boeing assigned Darcy-Hanneman as a production test pilot, the first woman to hold that position with the company. 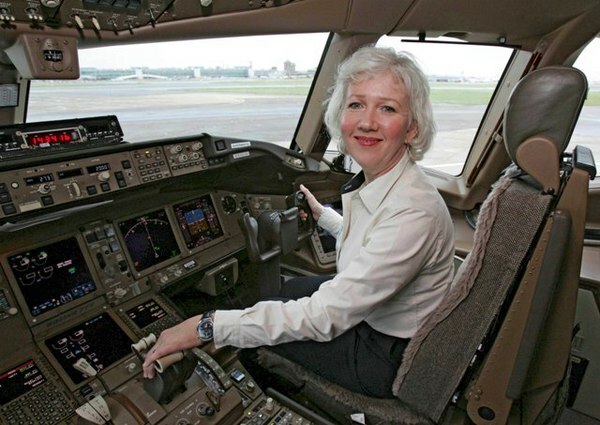 She was also the first woman to earn a captain’s rating on the 747-400, and is also rated on the 737, 757, 767 and 777. 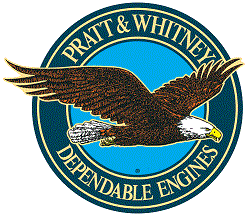 She performed flight testing on the 737-300 and was the project test pilot for the 777-200LR. In 2008, Captain Darcy-Hanneman became Chief Pilot, Boeing Commercial Airplane Services. She is a member of the Society of Experimental Test Pilots, and was inducted into the Women in Aviation Pioneer Hall of Fame in 2010. Flight Lieutenant Herbert Carmichael Irwin, A.F.C., Royal Air Force. 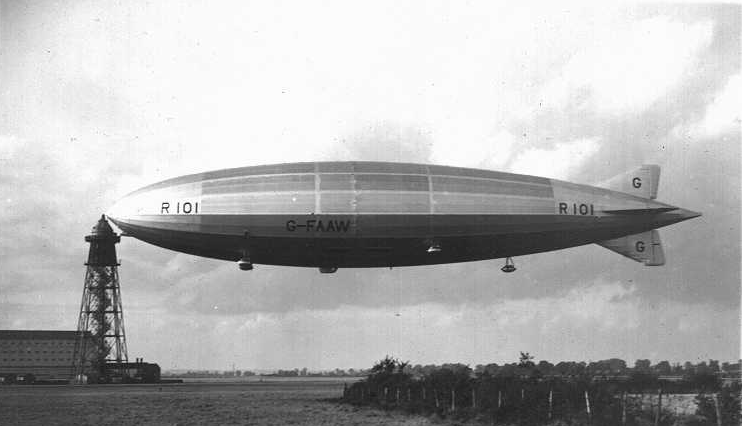 5 October 1930: Two days after receiving its Certificate of Airworthiness from the Air Ministry, the British rigid airship R.101, registration G-FAAW, was on its maiden voyage from Cardington, Bedfordshire, England, to Karachi, India, with 12 passengers and a crew of 42. The new airship was under the command of Flight Lieutenant Herbert Carmichael (“Bird”) Irwin, A.F.C., Royal Air Force, a highly experienced airship commander. Among the passengers were Lord Thomson, Secretary of State for Air, Sir Sefton Brancker, Director of Civil Aviation, and several senior Royal Air Force officers who had been involved in the planning and development of the airship. 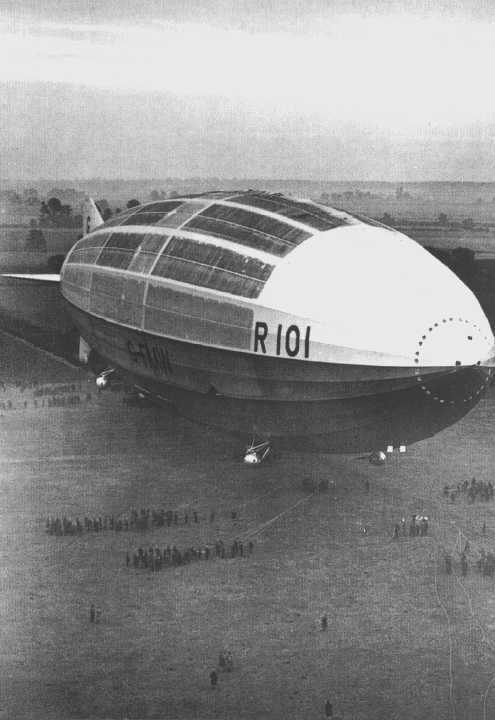 R.101 was the largest aircraft that had been built up to that time. Not until the Hindenburg was built five years later would there be anything bigger. Its teardrop shape and been developed in wind tunnel testing and actual flights with R33, which had been extensively modified to obtain detailed flight data. R.101 required a minimum flight crew of fifteen: a first officer, two second officers, two helmsmen and ten engineers. The airship was 777 feet, 2½ inches (236.893 meters) long and 131 feet, 9 inches (40.157 meters) in diameter. The airship had an overall height of 141 feet, 7 inches (43.155 meters). Built of stainless steel girders which were designed and constructed by Boulton & Paul Ltd., and covered with doped fabric, buoyancy was created by hydrogen gas contained in bags spaced throughout the envelope. The airship had an empty weight of 113 tons (114,813 kilograms), and 169.85 tons (380,464 kilograms) of gross lift capacity. The maximum gas capacity of the airship was 5,508,800 cubic feet (155,992 cubic meters). The hydrogen weighed 71.2 pounds per 1,000 cubic feet (32.3 kilograms/28.3 cubic meters). The airship’s fuel capacity was 9,408 gallons (42,770 liters) and it carried 215 gallons (977 liters) of lubricating oil. R.101 was powered by five steam-cooled, 5,131.79-cubic-inch-displacement (84.095 liters) William Beardmore & Company Ltd. Tornado Mark III inline 8-cylinder heavy-oil compression-ignition (diesel) engines. These were developed from railroad engines. Each engine weighed 4,773 pounds (2,165 kilograms). They could produce 650 horsepower, each, at 935 r.p.m., but because of vibrations resulting from the very long crankshaft, engine speed was reduced to 890 r.pm., which decreased power output to 585 horsepower. Two of the engines, designated Mark IIIR, could be stopped then restarted to run in the opposite direction to slow or reverse the airship. The engines turned 16 foot (4.877 meter) diameter two-bladed wooden propellers, which gave R101 a maximum speed of 71 miles per hour (114.3 kilometers per hour), with a sustained cruising speed of 63 miles per hour (101.4 kilometers per hour). At 0207 hours, R.101 went into an 18° dive which lasted approximately 90 seconds before the flight crew was able to recover. It then went into a second 18° degree dive and impacted the ground at 13.8 miles per hour (22.2 kilometers per hour). 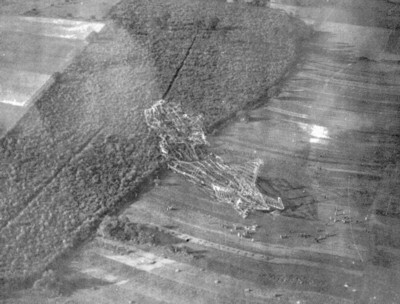 There was a second impact about 60 feet (18 meters) further on and as the airship lost buoyancy from the ruptured hydrogen bags, it settled to the ground. Escaping hydrogen was ignited and the entire airship was engulfed in flames. Of the 54 persons on board, only 8 escaped, but 2 of those would soon die from injuries in the hospital at Beauvais. This was a national disaster. The dead were honored with a state funeral, and all 48 lay in state at the Palace of Westminster. The cause of the crash of R.101 is uncertain, but it is apparent that for some reason it rapidly lost buoyancy forward. It was considered to have been very well designed and built, but as it was state-of-the-art, some of the design decisions may have led to the disaster.